On Wall Street, it’s best not to think too hard or to look too closely into the mouths of gift horses. Since making predictions based on actual economic understanding is rare, analysts typically look to provide explanations after the fact. Within the financial services industry, currency traders are perhaps the greatest practitioners of this craft. While they often get the fundamentals completely wrong, it never seems to stop them from offering bizarre theories to explain currency movements. After the Recession of 2001-2002, the dollar began an historic, nearly 40%, decline that bottomed out in early 2008. During that time, the falling dollar became a dominant topic in the financial world. While it was occurring, I argued that the sell-off was the result of the overly accommodating monetary policies of the Alan Greenspan-led Federal Reserve and the rapid increase of Federal debt under George W. Bush. Few currency traders agreed. Instead, most continually predicted that the slide would end long before it actually did. Their confidence may have been based on the fact that the Federal Reserve raised rates from 2003 to 2007. According to the textbooks, rising rates, which reward someone for holding a particular currency, are supposed to be a positive. Except, that time, they weren’t. I argued that the rate increases were too mild to actually strengthen the dollar and too slow to deflate the growing bubbles in stocks and real estate. Eventually the dollar decline stopped, but it took the chaos of the 2008 financial crisis to bring it about. After two and a half years of intense volatility that followed the aftermath of that crisis, the dollar settled into a long uptrend that began in April 2011 that has since added more than 30% to its value. When the rally started, traders attributed it to the first hints that the Fed would be winding down its Quantitative Easing bond buying program (which had been in effect since 2008). Even though those purchases didn’t fully end until 2015, just the thought that the program would be slowing inspired traders to buy the dollar. When QE came to an end, their anticipation then shifted to the Fed’s decision to lift interest rates from zero, a move that finally occurred in December 2015. Since then, they have attributed the rally to the rate hikes of 2017 and 2018 and the future hikes the Fed has said it intends to deliver this year and next. But during the entire rally, interest rates have remained below even the official rate of inflation, and America’s trade and budget deficits have kept expanding. Those factors should have dragged the dollar down. Instead, political troubles in the European Union and economic uncertainty in Asia, combined with massive central bank purchases of Treasury bonds, helped push up the dollar for unearned reasons. But as long as the trends conformed to their forecasts, no one questioned the causality. When 2017 began, bullish consensus on the dollar was off the charts. 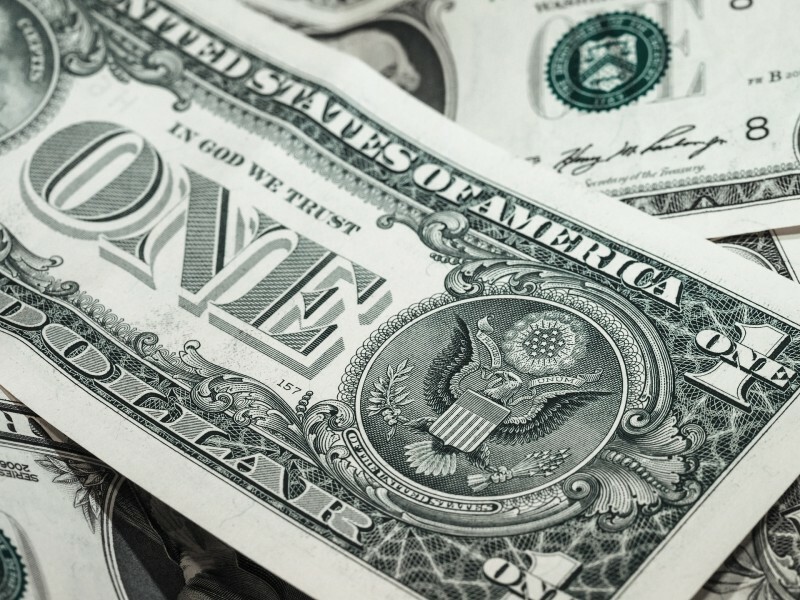 Yet despite multiple rate hikes throughout the year, the dollar defied consensus and fell sharply, notching its first annual decline in five years, and it’s largest yearly drop in fourteen. But following its worst January since 1987, the dollar has since risen by about 7% from its February low. To explain the turnaround, traders are now making similarly bad arguments and are extrapolating continued gains into the future. Incredibly, included among their bullish arguments are soaring federal budget deficits and the prospects for a protracted trade war. But they are wrong that those factors will help the dollar. Traditionally, rising government deficits have always been bearish for the dollar. That’s because it was expected that the government would have to borrow to meet the shortfall. More borrowing leads to more debt issuance, which puts downward pressure on bond prices and the dollar, especially when the Fed increases the supply of dollars to purchase those bonds itself. But this time the markets think it will be different. While it is well known that deficits are rising dramatically as a result of the recently passed tax cuts and spending increases, traders amazingly assume that the Fed will not need to accommodate the larger deficits with easier money. Instead they believe that the Fed will continue to tighten policy, raising rates through this year and next. They also believe that the Fed will actually tighten further by selling $50 billion per month of its own inventory of Treasury bonds into the market (which the Fed has indicated it will do beginning in October of this year). By flooding the market with an unprecedented supply of treasuries, the thinking is that a dollar shortage will ensue. That is because the global dollar supply will be absorbed by the U.S. government, crowding other borrowers out of the market. The biggest losers are assumed to be emerging markets, where dollar funding plays a significant role in local finance. If you don’t bother to actually think it through, such an idea may make sense. But it evaporates under closer scrutiny. Since treasuries are merely interest-bearing dollars, as the supply of treasuries soars so does the supply of dollars. As investors loan dollars to the U.S. government, those dollars get spent right back into circulation, allowing the same dollars to purchase even more Treasuries. So the market will never run out of dollars, as the government will constantly spend whatever quantity it borrows back into circulation. Even if the Fed manages to shrink its $4.5 trillion balance sheet, the Federal Government’s balance sheet will continue to swell. The world will be awash in dollars in one form or another. The Fed issues liabilities in the form of Federal Reserve Notes, which have no maturity and pay no interest. The U.S. government issues liabilities in the form of interest bearing Treasury debt of varying maturities. But the total dollar supply is actually the sum of all government liabilities, whether issued by the Fed or the Treasury. The only caveat is that one needs to believe the Fed would never allow the Treasury to default. My guess is that since the markets regard Treasuries as being risk free, that assumption has clearly been made. But the larger issue is that as the deficits continue to grow they will cast an ever-larger shadow over the entire economy. More Federal red ink should force interest rates higher and may convince the Fed to abandon its plan to shrink its balance sheet (if the plan ever really gets underway in the first place). As the Fed monetizes the ballooning deficit, both the Fed’s and the Treasury’s balance sheets will expand in tandem. When that happened after the 2008 Crisis, the increasing dollar supply was offset by voracious demand from foreign banks, and markets remained optimistic about the Fed’s ability to quickly turn off the monetary spigots when the economy got back on its feet. As a result, the dollar did not fall. But this time around, we may not be so lucky. If the Foreign banks stay away, if optimism on the economy fades, and if confidence in the Fed’s ability to mop up the liquidity is lost, dollar demand may prove insufficient to meet a deluge of supply. In other words, the dollar will fall. Traders are also betting a trade war will reduce U.S. trade deficits, which will be bullish for the dollar. It won’t be. A reduction in the trade deficit may result from Americans buying less not selling more. A decline in imports may lead to a decrease in U.S consumption, which would slow U.S. GDP growth, decrease employment, and lower tax receipts. This might lead to an increase in the U.S. government’s budget deficit. In other words, a trade war may just move our red ink from one pocket to another. Also a slowing economy may force the Fed to cut rates rather than raise them, a development that few people now expect. As all surprises tend to do, this may shock the markets and could send the dollar tumbling. But a bigger problem for the dollar may be that all of this trade tension may threaten the dollar’s reserve currency status. China seems to be working feverishly to prepare for a world in which the dollar is not at the center. That would be the biggest blow the dollar could receive. While this is unlikely in the near term, if a trade war really gets ugly, anything is possible. A trade war may also finally prompt China to do the smart thing and dump its trillion-plus holdings of U.S. treasuries. This would send long-term interest rates much higher, further slowing U.S. consumption and put pressure on U.S. asset prices. Many believe this nuclear option will never be tried, as it could lead to mutually assured destruction. But selling a portfolio of low yielding, dollar-denominated Treasuries near the major top of a 30-year bull market could be a great trade for China. And since most of China’s Treasury holdings are short-term, there may be no need to sell. China merely may ask for their dollars back when they mature. So all the selling may be in the forex rather than the bond market. However, there is no way for both China and the Fed to shrink their balance sheets simultaneously, especially if the U.S. government’s balance sheet is also expanding. So if China pushes, the Fed may have to shove its shrinkage plans aside. With the Fed creating dollars not only to fund growing budget deficits, but to repay China, and with China dumping those dollars on the forex market, a dollar crisis could easily ensue. But in the short run, dollar strength is causing paper FX losses for those who have invested in non-dollar assets. It is also pushing down the local currency prices as well, especially in emerging markets that are hit extra hard by the dollar’s rise. (Many of these countries have issued dollar-based bonds and have gotten squeezed as a rising dollar makes the debt more difficult to service). Dollar strength also pushed down gold and commodity prices, compounding the problem for those who have invested under the assumption that the dollar will fall. But the stories that traders tell themselves in order to justify price movements (that are fundamentally unjustifiable) can fall apart very quickly. New stories can replace the old ones. The next one may even be closer to the truth. If so, investors would be well-served to look for signs that the Fed is not nearly as hawkish as it likes to pretend.